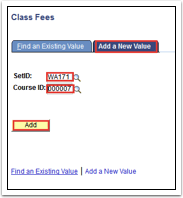 Enter the SetID and Course ID on the Add a New Value tab. Click the Class Fees tab to enter the basic data for the class. Charge Method: should remain with the Always default to charge the student the class fee in additional to tuition. If the only the class fee should be charged, select Not Include in term tuition from the drop down menu. Charge for Wait Listed Class: class fee is to be charged to a wait listed student. Charge for Course Fee: charge course fees in addition to class fees. If you do not select this check box, class fee definitions override course fee definitions for the same class. Include in Pro-rata: class fee is included in pro rata refund calculations. Include in other Withdrawal: include this fee in other withdrawal calculations. 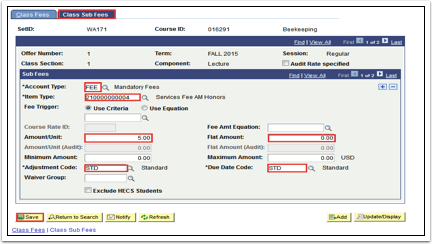 Click the Class Sub Fees tab to select the fee to charge and enter the amount. Select an Account Type and Item Type. Fee Trigger: Always select Use criteria. Fee Amount Equation: Leave blank. Fee Amount fields: Fees can be set as a per unit charge or as a flat amount. Min/Max Amounts: These fields only apply to this class section and would only be used if charging per unit. Due Date Code: STD (Standard). Use the (+) sign to add additional fees.